The 1990s saw a theatrical renaissance in former Yugoslavia. We have only had glimpses of it on the London stage. Woman Bomb should begin to remedy that. The UK premiere of Croatian playwright Ivana Sajko’s Woman Bomb naturally arouses some trepidation. How will she deal with possibly the most provocative act of all – suicide bombing? How can the female of the species, she who gives birth and nurtures, become a weapon of destruction? Will it make you weep, will it be exploitative, will it be too hard to watch? Will it make moral or political judgements? Sajko is the most outstanding of a generation of playwrights from the independent scene which arose in Croatia during the war-torn 1990s, says producer Berislav Juraić. Known for her fearless and sophisticated approach to political subjects, she wrote Woman Bomb in 2003. But it took recognition in Germany and France to secure the first performance in her native town of Zagreb. Director Maja Milatović-Ovadia is no stranger to hard-hitting drama. She positively relishes the challenge of theatre that blasts through audience preconceptions – both in terms of theatre and politics. She says that Sajko is best known for a multi-disciplinary approach and an experienced practitioner of auto-referential reading. In this kind of 'meta-theatre', the writer becomes part of the story – a bit like the role of the Chorus in ancient drama or the device of the play within the play so often used by Shakespeare. Thus Woman Bomb opens with the playwright herself “reading my agent’s notice that a theatre has cancelled a production of my play ‘RibCage’ “ due to undesirable metaphors of “individual resistance to formidable violence”. Sajko wrote the play entirely without production guidelines or individual character delineation. Each new staging, therefore relies on the director and the actors to bring their own structure and sensibilities to it. Directors Milatović-Ovadia and Vanda Butković and the London cast have risen admirably to the challenge. Nikki Squire and Laura Pradelska appear in the guise of fair priestesses, garbed in ivory-white plaited dresses of a timeless design, a pattern mirrored by the zigzag of bricks on the floor. The bricks snake up to support the playwright’s desk – the only furniture on the stage. The stark set, which includes projections on the screen by video-designers Mafalda Cruz and Dan Oki, focuses our attention on the stream of consciousness as the seconds tick by in the countdown to the moment of destruction. Their musings inform us about the playwright’s researches as they leaf through sheaves of research notes. Far from being the exceptional in terms of suicide bombings, one third are by women. The two women are the writer’s alter egos – switching between the dry stating of fact and motivations and convulsive emotion as the tension builds up. The effort to project into the mind and feelings of the bomber is so powerful that the playwright suddenly morphs into the bomber (Laura Harling) who rises from a seat in the audience to the sound of tick-tock, tick-tock as the watch counts the last minutes and seconds in the life of the bomber. Casting a blonde-haired English rose in the role is a coup de force, bucking the assumption that such acts of violence would surely only be carried out by dark-haired non-Europeans. Harling is both a creature of the writer’s imagination and a force in her own right. The youngest of the three, she is casually dressed like a London student in leggings and boots – and bursting with anger and sarcasm against her political target. It is both hard-hitting and shocking, as Squire and Pradelska acting as a double chorus, set out the whys and hows of suicide bombing. Meanwhile Harling prepares herself for the ultimate act of sacrifice. She turns her back to the audience and disrobes. Sitting on the floor, she begins to wash herself slowly and carefully as though in a ritual. The three characters – three aspects of one mind – struggle with how the question of violence and what constitutes terrorism can depend on your point of view. Concentrated jolts in the narrative take us backwards and forwards – from history to immediacy, from outside to inside, from past to present, from observer to performer – challenging us to re-think what theatre can be. Previews have seen largely female audiences. Do men find the subject even harder to think about than women? To stage it in a London still suffering the scars of the suicide bombing of 2005 takes some chutzpah – so all credit to the producers, the theatre and Westminster Arts. 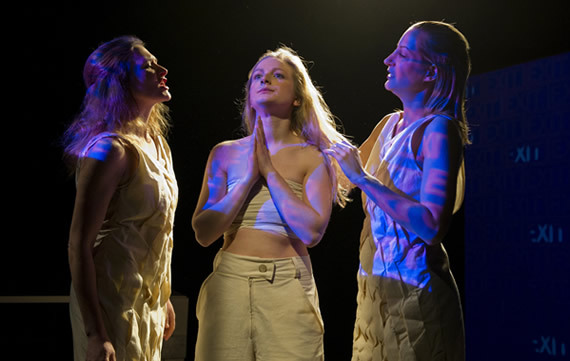 Woman Bomb by Ivana Sajko opens tonight at the Tristan Bates Theatre, Covent Garden until 12 March and returns 2-14 May. It is Just a Must’s second production in the UK. Box office 020 7240 6283. Additional funding for performances in May has come from Arts Council England.